On arrival you will be welcomed by our representative who will introduce to your dedicated chauffeur, assigned to you throughout the tour. You will be transferred to the dynamic fishing village of Negombo to begin your first day, where you’ll be introduced to some of Negombo’s curious sites such as the Dutch churches perhaps take a boat ride along the Dutch canals or enjoy the beach if the time permits. Overnight Stay : Hotel in Negombo. Day two is all about Sigiriya. After a hearty breakfast we will be climbing the 5th Century "Fortress in the Sky" named as Sigiriya. Built by King Kassapa the fortress was a Royal Citadel for more than 18 years. The fortress (A UNESCO WORLD HERITAGE SITE) is of unusual beauty, rising 200 metres from the scrub jungle. The base of the rock is ringed by a moat and rampart and extensive gardens including the renowned water gardens. The majestic Lion’s Paw picturesquely guards the stairway of the palace on the summit. See the famous frescoes of the "Heavenly maidens" of Sigiriya in a sheltered pocket of the rock and the 10 foot high Mirror Wall. After breakfast head for Sigiriya, to take in the sites of the land in a hot air balloon. Experience peace and tranquillity amongst the clouds as you take in the sights. Be awed by the Sigiriya rock, the temples, fields and other great attractions from this new vista. In the afternoon leave for Minneriya for a Jeep Safari. Minneriya National Park is about 8889 hectares in extent and is an ideal eco-tourism location in Sri Lanka. It is home to Sri Lanka’s favourites such as spotted deer, Sambar, leopards, Sloth bear and elephants. After Breakfast head to Kandy. 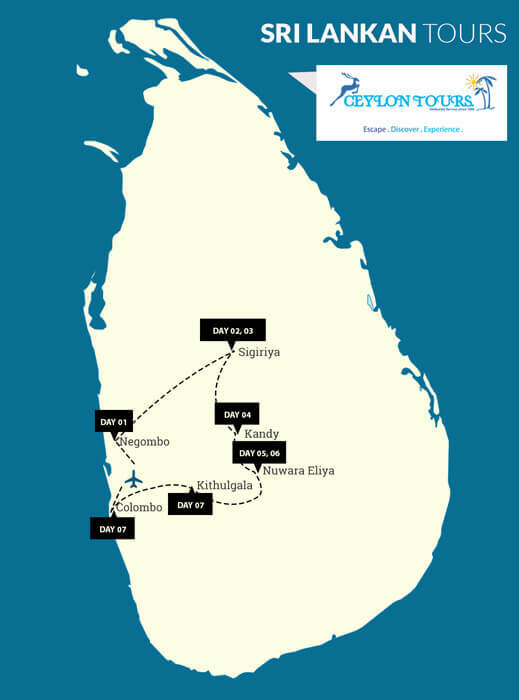 En route you will visit the much famed spice garden in Matale. You will check in at your hotel on arrival and once you are rested, continue on to your tour of Kandy. Kandy – The hill country capital is a UNESCO World Heritage Site that is famous for the Temple of the Tooth which houses the most sacred religious relic, the tooth of the Buddha. The Kandy Lake built in 1807 and the Peradeniya Botanical Gardens are some of the key attraction points that elevate the grandeur of the city. In the evening you will visit the sacred Temple of the Tooth Relic. Thereafter enjoy the Kandyan Cultural show at the Kandyan Arts & Cultural Centre. The show features the graceful and rhythmic dancers and drummers culminating in an impressive fire walking display. After breakfast leave for Nuwara Eliya En route visit the Peradeniya Botanical Gardens where a rare collection of tropical exotic and indigenous flora including the famous Orchid House could be viewed. The beautiful town of Nuwara Eliya, set in the heart of Tea country and situated 1890 meters above sea level, is where the British succeeded in creating an English countryside with homes in styles from Georgian to Queen Anne. After an early breakfast at the hotel, leave for Horton plains, recorded as the highest plateau in the country. It is one of the key National parks in Sri Lanka, especially noted for its topographical variations. It has unique vegetation and is famed for many rare and endemic highland birds. The most inspiring physical feature of the Horton Plains is the escarpment that falls 880 meters to the lowlands of the southern region of the island. Aptly known as the "World’s End" the view from the precipice of the countryside below towards the south coast is spectacular. Return to Nuwara Eliya by bike, and at your convenience commence a sightseeing tour of the city. Visit the Nuwara Eliya Town, Market place, Golf Course, (one of the finest 18 holes Golf courses in Asia) the Hill club, and drive around this hill station viewing Lake Gregory. After breakfast leave Kithulgala a small town perched on the hills that slope down to the flowing waters of the Kelani River. The main attractions include white water rafting, trekking and the Kelani Forest Reserve a popular bird watching location. Enjoy a thrilling day of white water rafting. In the afternoon leave for Colombo. Check in at you hotel on arrival. After some well-deserved rest you can drive through the commercial and city centre known as the "Fort", built by the Portuguese in the 16th century where grand colonial era buildings stand alongside modern office structures. See the vibrant markets and bazaars of Pettah, and the National Museum with its fine collection of lovely antiques and art of Sri Lanka. You could visit a Buddhist temple and a Hindu Kovil to experience the diversity of religion, ethnicity and customs of the people. Alternatively you may indulge in some shopping. Now that you are at the end of your journey with us, after breakfast your chauffeur will comfortably take you to the international airport in time for your departure flight.